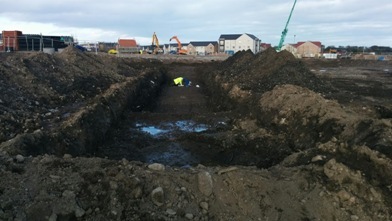 The ever increasing cost of land in the Aberdeen area, coupled with increased environmental oversight and awareness over the entire UK, has led to a variety of land development schemes that differ from run of the mill cut and fill platforms.The Ross' Land development, involved the excavation of a recent landfill site, followed by back filling and residential development of the reclaimed land. The purpose of this scheme was to develop an otherwise unavailable piece of land, while improving the environment of the area by recycling a significant portion of a historical landfill. The project is still ongoing, and has had an active life of more than three years. Excavation and backfilling works (carried out in line with waste remediation). Residential construction and post-groundwork monitoring. Stage 1:Completed prior to 2014, involved the drilling and installation of boreholes through the existing landfill, to determine the excavation requirements and other main job parameters for the following earthworks. Monitoring of gas, groundwater, and surface water from a nearby burn was undertaken by Raeburn Drilling & Geotechnical (Northern) Ltd in 2013-2014, to investigate any potential contamination from the landfill. Stage 2: This was the longest stage of the works (running from early 2014 until mid 2016), and the one that Raeburn Drilling & Geotechnical (Northern) Ltd was most heavily involved in. 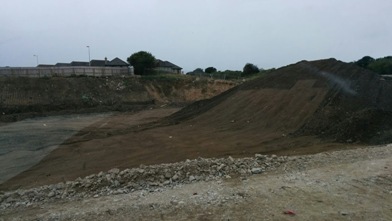 After the capping topsoil was stripped and stockpiled, the waste excavation began, along with remediation works. 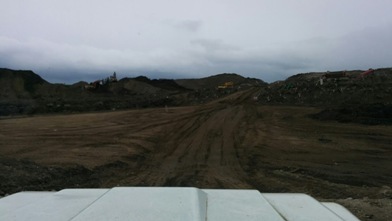 Landfill waste was excavated from the north of site and transported to a sorting area at the sites southern end. Material that could be recycled (wood for composting, scrap metal etc...) was separated out and transported to appropriate waste management sites elsewhere. Oversize material (boulders and concrete) were stockpiled for use in back filling works. Waste that could not be recycled was stockpiled for later disposal. Once primary excavation had reached depth at the north, back filling began, and waste excavation continued, moving south across the site. Back fill was progressed in 300mm thick layers (laid, compacted and tested) from the excavation base. 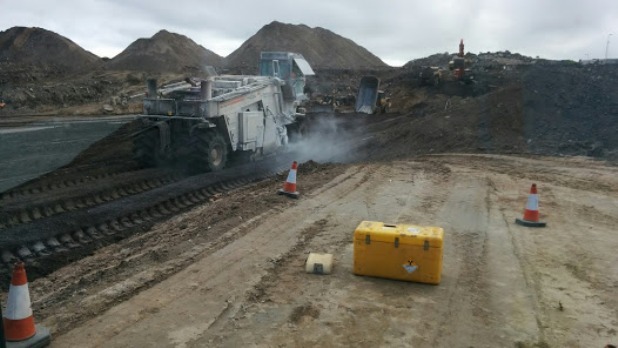 Raeburn Drilling & Geotechnical (Northern) Ltd were contracted for in-situ and laboratory validation of the back fill material and carried out a variety of testing as the filling progressed. For a significant period this testing required the constant site presence of two Raeburn Drilling & Geotechnical (Northern) Ltd site technicians, to undertake different tests while keeping up with back-fill speed. Nuclear density and sand replacement testing for validation of fill compaction. in-situ/lab California bearing ratio (CBR) for under road areas. Particle size distribution and Atterberg limit for material classification. dry density/moisture content relationship for density comparisons. Moisture condition value for further fill validation. As the works progressed, crushers were brought in to process the previously stockpiled oversize. 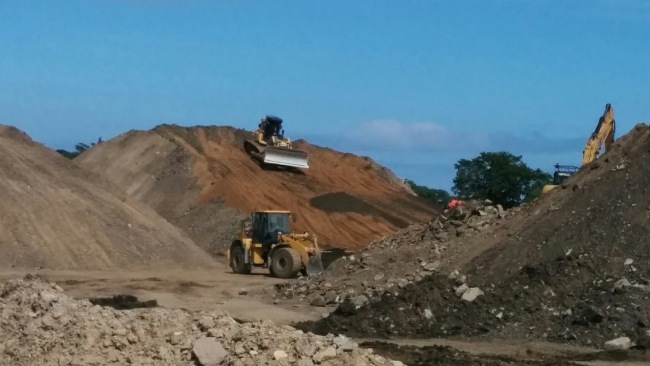 The resulting granular material was added to the back fill, along with type 1 from a local quarry to make up the shortfall caused by waste removal. Lime stabalisation was also used at times to improve the structural characteristics of the placed fill. These changes to the fill character required re-calibration of our testing equipment on many occasions in order to maintain the accuracy of our results. 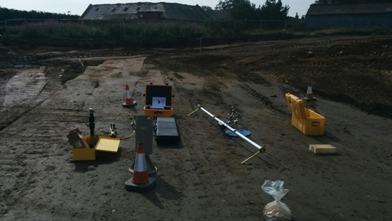 On reaching final finished level: boreholes were drilled and installed by Raeburn Drilling & Geotechnical (Northern) Ltd, at locations, and to depths specified by the client, for the purpose of sin/post construction gas and water monitoring to comply with national house building regulations. The final round of Raeburn's contracted gas monitoring was completed in early 2017. Also see our other Projects information.